Buddy Scalera was a featured guest in the Content Marketing World B2C Roundtable discussions. These conversations featured Karen Budell (moderator and host), Michael Weiss, David Germano, author Andrew Davis, and Julie Fleisher of Kraft. The roundtable team discussed a variety of content marketing, content strategy, and social media issues. The videos were shared on Vimeo. Buddy was also a featured speaker at the Content Marketing World event. 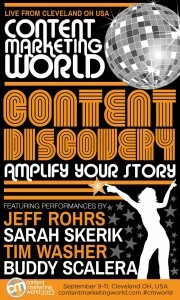 To learn more about the Content Marketing World conference in Cleveland, go to: http://contentmarketingworld.com/. CMW B2C Research Roundtable: LinkedIn for B2C from Content Marketing Institute on Vimeo. 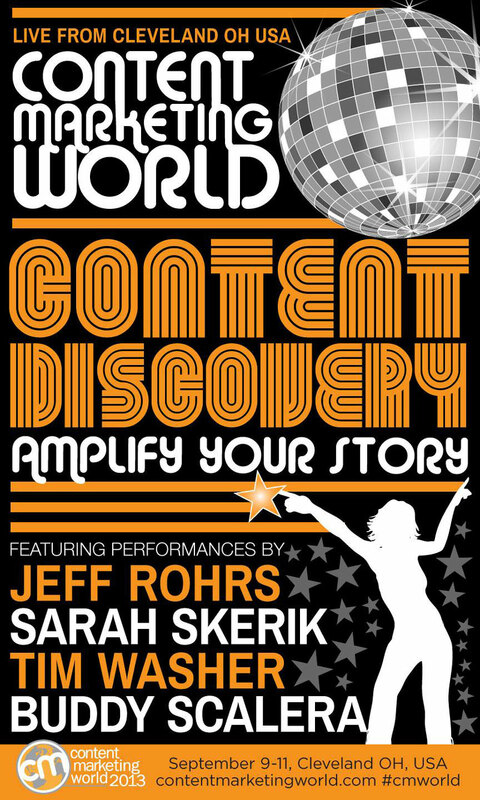 In a few days, I’ll be presenting at Content Marketing World in Cleveland, one of the premiere events in marketing and content strategy. If you work in content, content marketing, content strategy, analytics, or social media, this is the must-attend event of the year. Joe Pulizzi and the conference planners have created and shared some clever materials, including a series of posters featuring different speakers. Of course, we love to see our names, so everyone on the poster is sharing it on their social channels. My poster in the series has a disco theme and includes Jeff Rohrs, Sarah Skerik, and Tim Washer. I talk to my clients a lot about social and viral assets. This is an excellent real-time example of how to create content assets that travel through sharing and endorsement. They’ve also created a SlideShare presentation that included quotes from many of the speakers. And, of course, the views and likes for this thing are impressive as hell. The original PowerPoint asset was posted August 14, 2013 on SlideShare. As of this writing, it’s already at 34,819 views. Remember, this is a deck leading up to a business conference. This isn’t some goofy pop culture thing from MTV or People magazine, so you don’t usually see view rates like this on business content.